Skill Level: 1 Glue, sanding, cardboard fins, paint. The Viking can be built with three, four or five fins in 48 possible arrangements. This makes it perfect to use for comparison studies in aerodynamics. In fact, the Viking is so popular there's even a GEMS book written for it. No matter how you place the fins, this unique, adjustable rocket offers the ultimate in high performance model rocket flight! 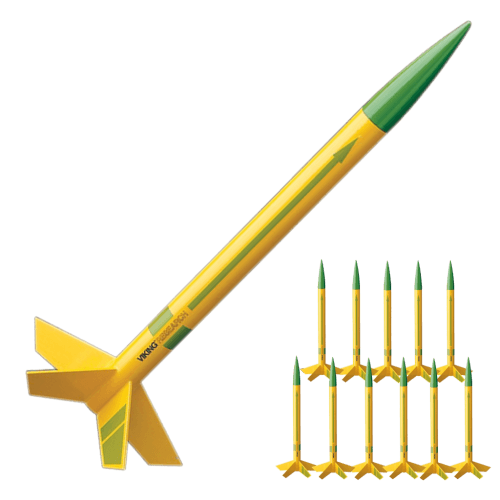 This easy-to-build, Skill Level 1 rocket kit includes a molded nose cone, a single piece body tube, card stock fins and self-stick decals. It's another friction fit, standard engine rocket that requires simple painting. The Viking can reach amazing launch heights over 1,600 feet and will drift back to earth on a bright streamer. The Viking is our most economical bulk pack rocket, so if you've got a tight budget it's definitely the one for you!